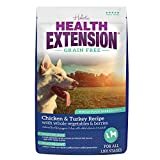 Health Extension Grain-Free Dry Dog Food flavors include: chicken and turkey, venison, duck or salmon. 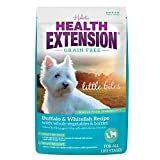 Health Extension Grain-Free Dry Dog Food also includes astralagus, blue-green algae, ginger, gingko biloba, and primrose oil. Health Extension products do not contain wheat, corn, soy, rendered animal fats, or added sugar.